The Purge franchise has never quite lived up to its spiteful premise – that for one night a year all crime is legal in America. Written and directed once again by James DeMonaco, this third entry is exciting, brutal and dumb in about equal measures. Imagine what Donald Trump sees when he closes his eyes, and you're most of the way there. Senator Roan (Elizabeth Mitchell), who lost her family in an earlier Purge, is campaigning to have the practice banned. Ruling party the New Founding Fathers won't allow that – it's too good an excuse to let the poor kill each other, thus trimming the welfare spend – so they decide to do some 'spring cleaning' instead, with Roan top of the hit list. As mayhem engulfs the city, Roan goes on the run with the head of her security detail (Frank Grillo, returning from part two) and winds up at Joe's Deli, where the proprietor (Mykelti Williamson) and his team are holed – and tooled – up waiting to scare off looters. With a genuine sense that anything could happen – masked, kill-crazy schoolgirls spill out of a fairy lit car waving gold-plated AK47s, moments of tense, adrenaline-fuelled horror and a side order of political outrage – the stage is set for a punchy if pulpy siege movie. Imagine what John Carpenter would have made of this material? But once DeMonaco decides to take on City Hall as well, the action becomes diffuse, the story unruly, and some terrible dialogue ('There's a whole bunch of Negroes coming this way', says Joe, 'and we're sitting here like a bucket of chicken! '), threatens to ruin the day. That's a pity because for the most part, the film has an impressive sledgehammer effect that, like the Purge itself, you have no choice but to go along with. Wide release from Fri 26 Aug. 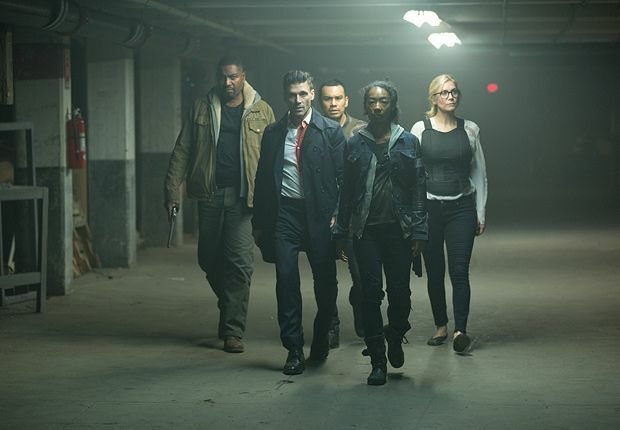 In 2040, the sole survivor of a Purge killing is now a US senator (Mitchell) running for President, and she and her head of security find themselves out in the streets on Purge night. Exciting, brutal and dumb in equal measures, although it runs out of steam in its final act.